This is the documentation for the Atlassian Confluence app Slack for Confluence. 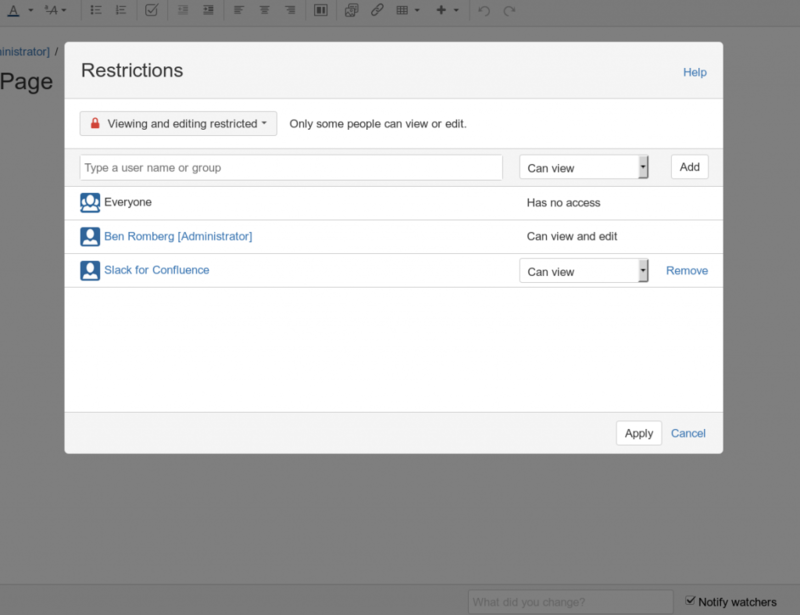 Head to the General configuration within Confluence by clicking on the cogwheel in the upper-right-hand corner and selecting “General configuration”. Note that Administrator privileges are required to access the General Configuration. In the menu on the left side, navigate to “Find new add-ons” under the “Atlassian Marketplace” category. Search for “Slack for Confluence”, wait until the entry “Slack for Confluence” is shown and proceed to “Install” the add-on. After having installed the Add-on from the Atlassian Marketplace, you first need to do some general configuration. 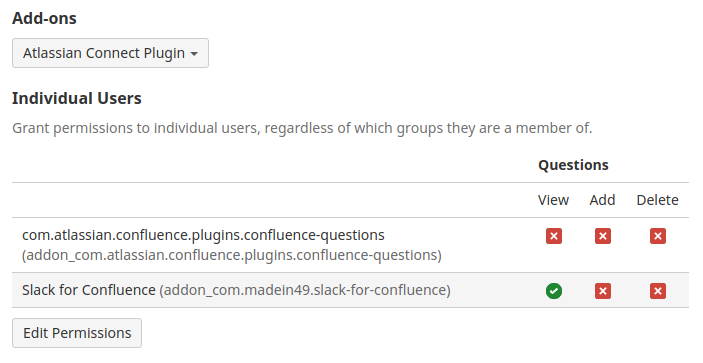 Please head to the General configuration and select the “Slack for Confluence” menu entry on the left side under the “Configuration” category. There, you need to paste a “Slack Incoming Webhook URL” into the form. To generate the URL, just click on the “Create a new Incoming Webhook in Slack” link and setup a new Incoming Webhook within Slack. Make sure to use a public channel for the Webhook – e.g. #general – the exact channel and other settings like bot icon and name in the Incoming Webhook don’t matter, as all of them get overridden within Slack for Confluence. 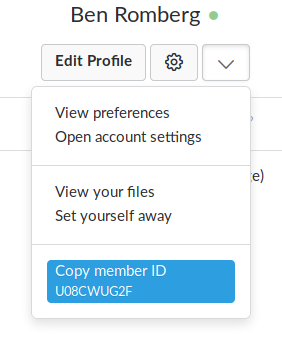 Proceed by copying the Webhook URL from Slack and paste it into the form in the Slack for Confluence configuration. You can also modify the Bot’s name, icon and the appearance of the notifications within Slack in the Global Configuration. To try out sending notifications, specify one or more channels under “Global notifications”. Note that all updates throughout the entire Confluence installation will be propagated with notifications to those channels and users, so it might not be reasonable to use this with big Confluence installations. You can configure more fine-grained notifications in scope of a Space, Page or User as described below. 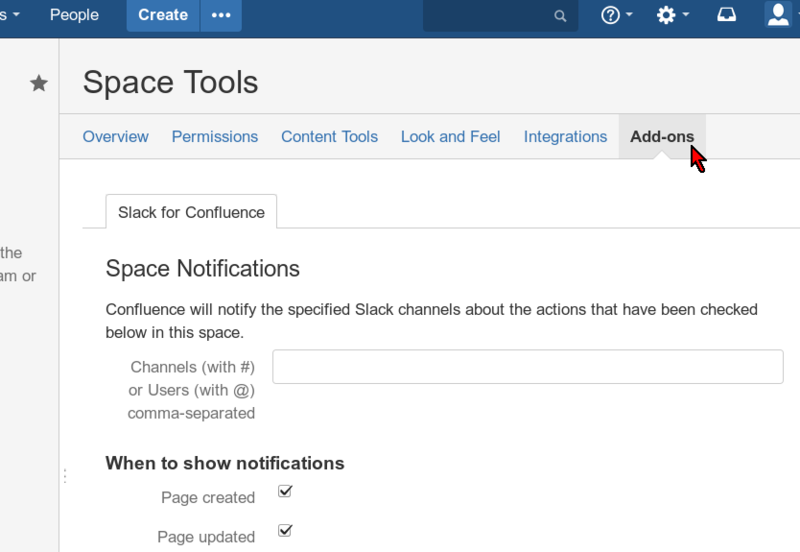 To access the Space configuration of Slack for Confluence, click on the “Spaces” drop-down next to the Confluence logo in the upper-right-hand corner and select “Space directory”. Here, click on the circled (i) button to access the Space details page of the Space you want to set up notifications for. 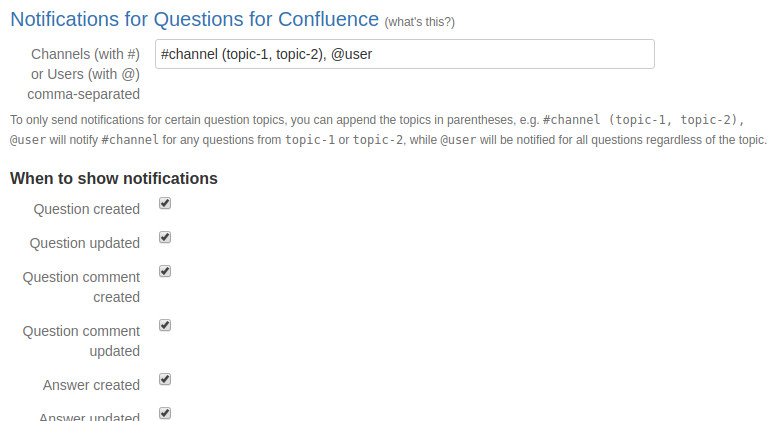 For newer versions of Confluence, you now need to select the “Add-ons” tab on the top of the page. 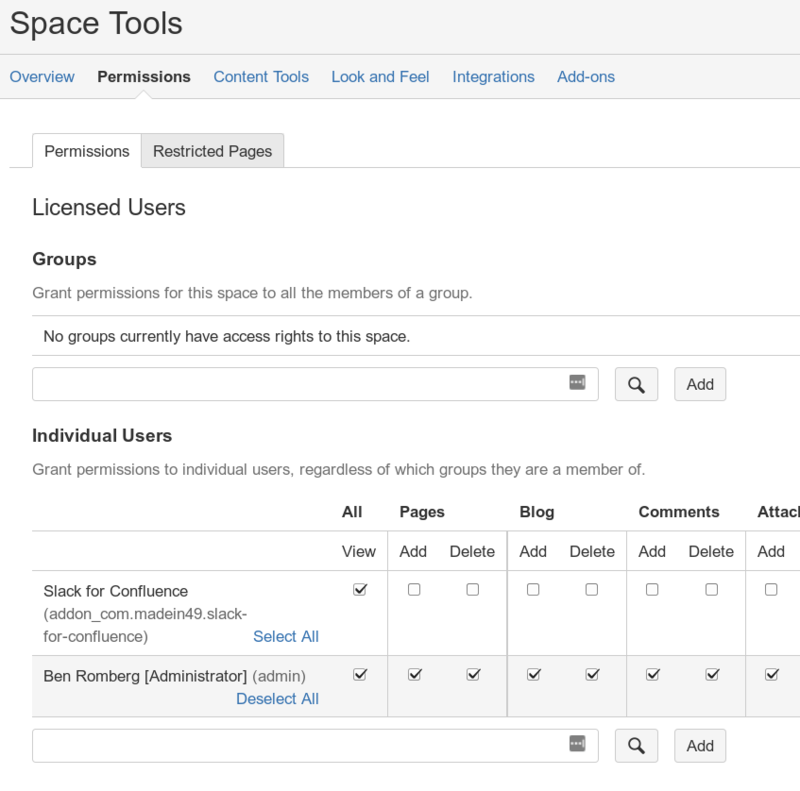 In older versions of Confluence, this tab is called “Space Admin”. Underneath, select the “Slack for Confluence” tab. Here, you can again set up Slack channels and users to be notified of any updates that are checked under the “When to show notifications” section. 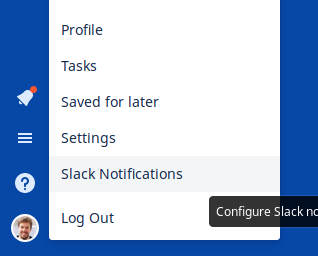 To send notifications when individual pages or blog posts are changed, you can access the configuration by clicking on the three dots in the upper right-hand corner and select “Slack Notification”. 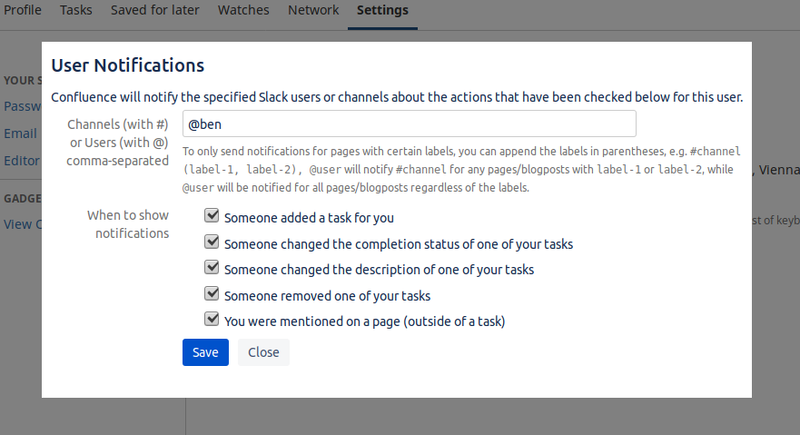 You can also notify yourself if you’ve been mentioned on a page or a task for you has been added, updated or removed. 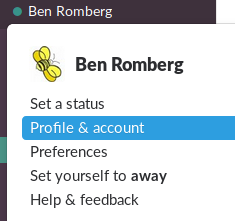 To configure notifications, click on your avatar (in the lower left-hand corner for cloud, upper right-hand corner for server) and select “Slack Notifications”. Here, you can again set up Slack users or channels to be notified of any updates that are checked under the “When to show notifications” section. If you want to get notifications only for pages or blog posts with certain labels, you can append the labels to the channels/users in parentheses as shown below. If you have the Questions for Confluence addon installed as well, you can also configure notifications when questions or answers have been updated. 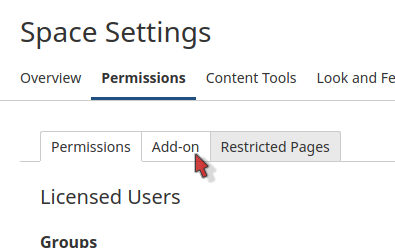 You can get notifications only for certain question topics, similar to how you can restrict notifications for labels on pages or blog posts, by adding the topics in parentheses. Enter this ID prefixed with an @, e.g. @U08CWUG2F into the notification configuration. Notifications should now work. Slack for Confluence is fully compatible with Mattermost webhooks. Make sure to use the technical channel name (i.e. the one in the URL) when configuring channels for Mattermost. If you encounter any other issues, feel free to send us an email at support@codefortynine.com. We’ll usually answer within 1-3 business days. Thanks for using Slack for Confluence!